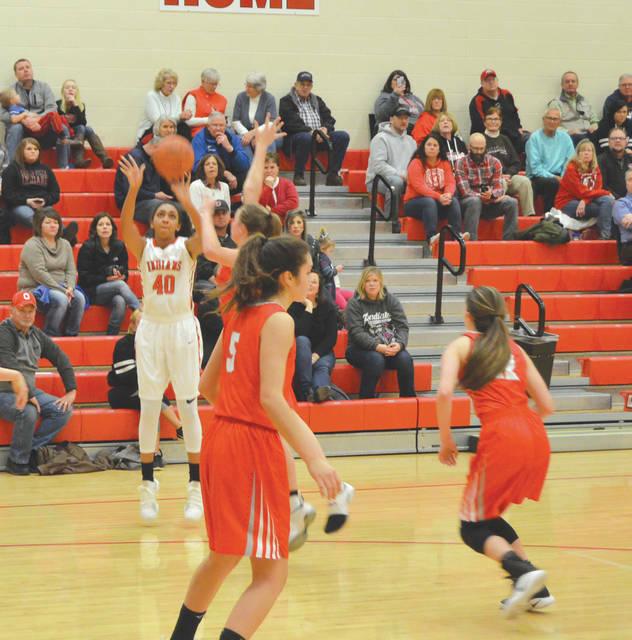 The Indians dynamic duo of Ise Bolender (left) and Maggie Coe led all scorers with 21 points each in a 68-39 Ohio Heritage Conference win Feb. 1 over South Charleston Southeastern, at Cedarville High School. Cedarville’s Celeste Rucker (40) puts up a shot in the first half of Thursday’s girls high school basketball game against Southeastern. Rucker finished with nine points in the 68-39 home win. CEDARVILLE — Playing with tenacity throughout the Indians lineup, Cedarville defeated visiting Southeastern 68-39 on Feb. 1. Indians scoring leaders Ise Bolender and Maggie Coe scored 21 points each, Celeste Rucker tossed in nine points while Sydney Wright, Sami Beuttell, Kaylee Cyphers, Elly Coe, Lauren Whitaker and Dani Ervin combined for 17 in a win that saw everybody playing with intensity. That level of play was what Indians coach Josh Mason was proud of the most after the dominating win. “The biggest thing for us at this time of the year, and what we’re trying to get everyone to buy into, is for everybody to get better with each time out on the court. Every day, it’s your goal to go out and play the best you’ve ever played,” Mason said. “What I have with this team right now is that they do buy into that. Every day, we wanna play the best we’ve ever played. And so Cedarville played 5-14 Southeastern (3-11 in the Ohio Heritage Conference) as if the school were playing for a world title. The Indians (15-4, 13-1 OHC) led 7-0 before the Trojans could get on the scoreboard. Cyphers opened up the night with a 3-pointer from the top of the arch, Bolender raced in from the right side for a layup and Rucker scored from the left on a nice assist from Maggie Coe. Cedarville led 23-9 after one quarter, and 36-17 at halftime. Nearly half of the Indians’ points were scored from behind the 3-point line. Maggie Coe drained six 3-pointers in the contest, Bolender hit two with Wright and Cyphers hitting one each. After his regular rotation of players amassed a 59-25 lead after three quarters of play, Mason began the fourth with a lineup of Rucker, Ruby Stack, Wright, Beuttell and Elly Coe. With five minutes left, he rotated the entire Indians lineup out, with Abby Camarato, Audrey Waymire, Ervin, Maddie Kinney and Whitaker in the lineup. Despite all those player changes, the team’s intensity never waned. “The biggest thing about our depth is just how well they play in their roles,” Mason said. “We have girls who embrace and love to play defense and get after it. It’s easy to play them, when I know they’re going to give me 110-percent on the defensive side of the ball. I think all the girls that I play do that. Southeastern’s Leslie Flores led the Trojans with 12 points scored. She gave it her all as well, before fouling out with 5 seconds left on the game clock. Trinity Cline was next, finishing with eight points. Cedarville returns to action Saturday, Feb. 3 at home against Springfield Central Catholic. 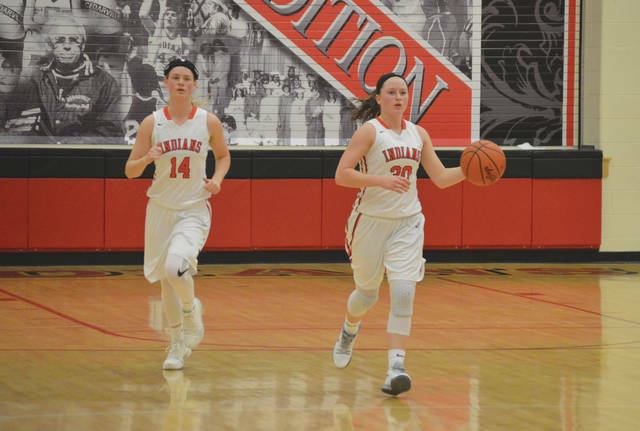 https://www.xeniagazette.com/wp-content/uploads/sites/32/2018/02/web1_BolenderCoe_PS.jpgThe Indians dynamic duo of Ise Bolender (left) and Maggie Coe led all scorers with 21 points each in a 68-39 Ohio Heritage Conference win Feb. 1 over South Charleston Southeastern, at Cedarville High School. https://www.xeniagazette.com/wp-content/uploads/sites/32/2018/02/web1_CelesteRucker_PS.jpgCedarville’s Celeste Rucker (40) puts up a shot in the first half of Thursday’s girls high school basketball game against Southeastern. Rucker finished with nine points in the 68-39 home win.